The Mitel 4425 IP Vision is a high-end IP telephone with advanced features, including multiple line handling and graphical display built to handle all user needs. It can also be used in small conference rooms. Elegant and sophisticated in design, the 4425 IP features 23 function keys with LED indicators. 17 are programmable for speed dialing or service features supported by the telephony system. Locally controlled feature keys are: mute key for switching off the microphone and volume control. The Mitel 4425 IP supports up to four extra key panels with 17 keys. Using the navigation keys in combination with soft keys, users can easily access a display menu with a number of system features, such as phone book, call list, diversion and absence reason. The 4425 IP also supports a headset features a full-duplex, hands-free speakerphone. 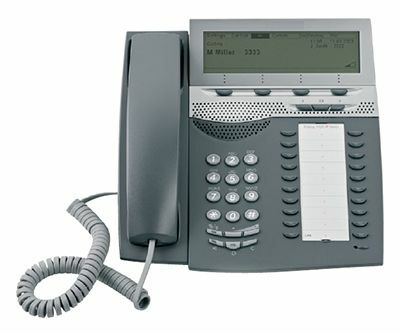 Mitel's 4400 series IP Phones are easily configured remotely. Software upgrades from a central location simplifies operation and maintenance. With all this plus a PoE Class 1 rating, the Mitel 4425 offers powerful functionality at an exceptional value.